This is the method you will often find in ready-to-wear, where the vent on the shell is first constructed, the lining is then attached to the hem, and finally the buttons are sewn on. Personally I don’t usually bother with buttonholes, but if you decide to insert them, do it before you insert your lining. There is no need to cut them as they are nonfunctional and purely decorative. I know a lot of home sewers bumble their way through this area with bits of hand-sewing here and there, but it really is very simple to machine sew everything when you know how. 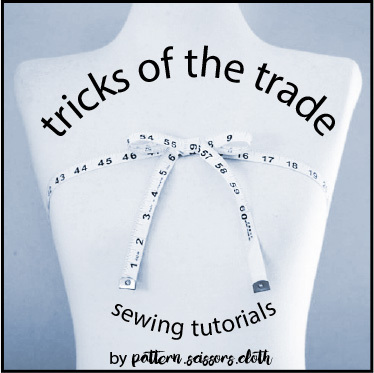 The most important thing is that your pattern is configured correctly (most home-sewing patterns aren’t) and once you understand how the pieces go together, there are only 8 simple sewing steps. Preparation is the key! hem notches – on side seams at level of hem fold line. While you are here, fold up along the hemline, and make sure your hem mirrors your outer shell. The hem width should be 4cm. undersleeve notch – on the undersleeve, draw a line from your hindseam stitching line to the hem edge, parallel to the vent edge, to position this notch. 2 notches for the vent mitre – on the topsleeve, fold along the hem fold line and vent fold line, and notch where their edges meet. It is best to add a seam allowance and trim the corner away as in the diagram, but I haven’t done this in my example. 2. Fold the top sleeve right sides together so the mitre notches meet, then sew from the notches to the fold line. If the corner of the vent is 90 degrees, you will sew 90 degrees to the fold line. Often the corner of the vent is greater than 90 degrees, and you will need to trim the corner as in the diagram above to sew at the correct angle. The hindseam will be pressed open, so clip the undersleeve only into the pivot point. Don’t worry – this area is all reinforced by fusing, and clipping on the bias means it is even less likely to fray. And once your buttons are sewn on there will be no stress on this point anyway. the topsleeve and undersleeve hemlines align – not like this example below! Sorry, but if you end up with this, you will have some unpicking to do! If you are a couple of millimetres out, it is possible to unpick just the undersleeve bag out, and restitch it so it is level with the topsleeve. More than this, and you need to check your allover accuracy. 4. Once you have this area looking good, sew your forearm seam, press open and your sleeve shell is done! If your hem width is 4cm, you can cut your lining to the hem fold, which allows 2cm ease in lining length. Cut your lining to this length, omitting the vent allowance but cutting parallel to it, as in the diagrams below – blue = lining pattern. 5. Sew the forearm seams of your lining, leaving a gap in one forearm seam for bagging out your jacket later. 6. Sew the hindarm seams of your lining. Sew around the cuff circumference as far as you can neatly sew. I usually have about a 1cm gap in my stitching around the vent. That is OK, it presses upwards and will be enclosed when you attach the buttons. 8. Before you press the hem you need to tack the hem up at the forearm seam first. Fold this seam along the hem fold, and from the inside grab the seam allowances lying face to face and sew them together. Make sure the hem is folded up exactly at the hem notch, line up the cut edges, and backtack about 2cm above the hem fold. This step is illustrated here in photos 10, 11 and 12. Now you can turn your sleeve through and safely press. OK I lie – there is a step 9 – you need to sew on your buttons! It is best to attach the lowermost button through the hem layers to ensure the corner of the vent sits flat and does not curl out, and all other buttons should be sewn through all layers of the vent facing. That’s it -who said two-piece sleeve vents were hard?! What a wonderful blog you have. I look forward to reading through it all. Looks so wonderful. May I publish a link to your tutorials on my blog “Sewing tutorials”? Yes Sigrid, that will be OK – thanks! you have just saved my day! Love, love, love this! Will participate in the RTW sewalong and my pattern actually doesn't call for a sleeve vent. I think I'll put one in thought, just to be able to admire – ehm – check my mitre. I should add something to this tutorial. When mitreing the top sleeve hem I said to sew perpendicular to the fold – this is true in cases where the corner of the sleeve is square, but this one is slightly angled and you will need to sew slightly off 90degrees. Trimming the mitre seam allowance gives you an accurate guide line for sewing. This is so great that I wish I understood it better! I know that it will help me, but as a self-taught pattern maker I'm not too familiar with the word 'hindseam'. I'm sure once I google it I'll be ok. LoL! I'm looking forward to that armhole lining tutorial… or is it already here? This is so helpful! I know you said this is a trick of the trade… do you know of any books that covers this (and other more nitpicky details of construction)? I was surprised that even my Cabrera tailoring book didn't cover this – it just has you fold and handstitch the mitre, and doesn't really touch on inserting the lining. Anyways, thanks a million for this! Silly question, what is meant by “Now sew your undersleeve corner – just fold your hem up along the hem fold line, bag out at 1cm and turn corner through:”? The “bag out at 1cm” part is confusing me. Thank you! Thank you for the clear and easy instructions to make the vent in a jacket! I am making a suit jacket for my son using a Burda pattern and the instructions not only don’t make sense, they leave the jacket vent unfinished. I haven’t sewn clothing for several years so my skills are rusty, but because of you, the jacket sleeve vent came out perfectly!! I am doing the happy dance! Thank you! Am so greatefull to have read through this your wonderfull set of instruction to making an advanced Vent. God bless you, I have just upgraded my self. Looking forward on tutorial of how to cut and sew a perfect Shawl Lapel.